Sign up for free and just shop with Make My Trip - International Flights as normal. Our average member earns over ₹5900 cashback a year. MakeMyTrip is an online travel portal which offers both domestic and international hotel room bookings, online flight bookings, homestay, bus tickets, cabs and also domestic and international holiday packages. For flight booking, the portal not only offers domestic flight bookings but also offers excellent deals and instant cashback offers on international flight bookings. Book tickets on MakeMyTrip via TopCashback and get access to massive discount sale on an international flight and save more with maximum discount and the bonus cashback offers. MakeMyTrip is headquartered in Gurugram, India and currently is the biggest online travel portal with millions of users availing its services every month. The company offers the best flights deals and coupons codes, so if you are planning a vacation abroad, make sure to get your international flight ticket using the latest MakeMyTrip coupons on TopCashback. MakeMyTrip offers some of the best deals on international flights with respect to their competitors. Just go to the MakeMyTrip website and search for flights using their amazingly fluid interface and then book the flight as per your choice. Some of the top international destinations include Singapore, Bangkok, New York, Kuala Lumpur, London, Hong Kong, Doha, and Colombo. Apart from these, you can also find the best international flight offers for Australia, Seychelles, France, Turkey, Russia, Japan, and many more exotic international destinations. TopCashback provides you the latest MakeMyTrip discount coupon to get instant discount on international air tickets. Find the best flights deals and discount coupons exclusively on TopCashback to Book your flights tickets and earn instant discounts and maximum cashback for your transaction value. You can also save additionally by making use of HDFC bank debit cards and SBI credit cards offer or by paying using the digital wallets like Amazon pay, Paytm or Mobikwik wallet. MakeMyTrip offers the best in class international travel experience by providing Wide range of options on international flights. They also introduced the best price guarantee on international flights so that you can avail the cheap international air tickets at affordable price ranges. On booking the international flights on MakeMyTrip, within 24 hours if you find a lower international airfare for the same itinerary from any other online travel portal MakeMyTrip will refund you 10 times the difference which is subject to a maximum of Rs.10000. Being a leader in online travel services for more than a decade they continue to serve more than 5 million happy customers. You get Various international airlines options like Air India, Qatar Airways, Etihad Airways .24/7 customer support, Premium service, Fare calendar, MyRewards program, Mywallet option and many more to keep their customers' delight. To make your online flight ticket bookings quicker and easier and to enhance the customer experience they have both the desktop site and the mobile app. When you book your international flight ticket online from MakeMyTrip you get frequently updated with the flight status, airfare drops in your inbox. In any situation, if you are about to cancel your trip, stay no worry because you also get free cancellation on flights and hotel on MakeMyTrip. What you are waiting for? Use MakeMyTrip Promo codes and get instant discounts on your booking amount. Also, activate cashback deals from TopCashback and get the highest cash back on international air tickets. Getting Cashback on your every online purchase, starting right from fashion, travel deals and recharge offers to movies and entertainment is extremely easy with TopCashback. Join TopCashback for free and do your shopping as usual like how you book your flights on MakeMyTrip. You will get instant discounts on your bookings by using the available MakeMyTrip discount coupons from us. To earn money back on your every international flights booking, all you have to do is, click through us and purchase online as normal and we’ll add the cashback amount to your TopCashback account. The cashback you earned is the real money which you can transfer to your bank account through NEFT or to you Paytm or Amazon pay wallet. 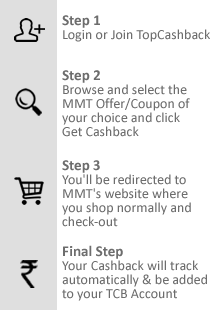 Moreover, TopCashback also offers the latest MakeMyTrip international flight coupons and promo codes with which you can access the sales happening on their website. Our cashback offers are valid on all existing discount coupons code, so you earn bonus money when you shop using TopCashback. MakeMyTrip is one of India’s most popular online travel portals where you can book for International flight tickets for hundreds of destination across the world. Find out the latest International flight booking coupons and promo codes on TopCashback and save extra money with TopCashback’s guaranteed money back deals on your every flight booking. Right from Bali to Baja California, book for any destination and fly high with lighter pockets!